a Mexican dish consisting of a fried tortilla, typically folded, filled with various mixtures, such as seasoned meat, beans, lettuce, and tomatoes. But honestly, this can mean different things to different people. It's probably safe to say that most Americans think the only choices you need to make when it comes to tacos are 'crunchy' or 'soft'. Some have been clued into 'puffy tacos' - which as I understand it are uncooked corn tortillas which are fried till they expand - and California or Baja-style tacos, which usually include a fried flour shell. There are all kinds of crazy variations out there also (tacodilla, anyone? ), which run the gamut from amazing to borderline travesty. But for the purposes of this post, I'm talking about traditional Mexican style tacos, for the most part. That means... THIS. Now THAT's a taco. (Al Pastor @ Los Portales). 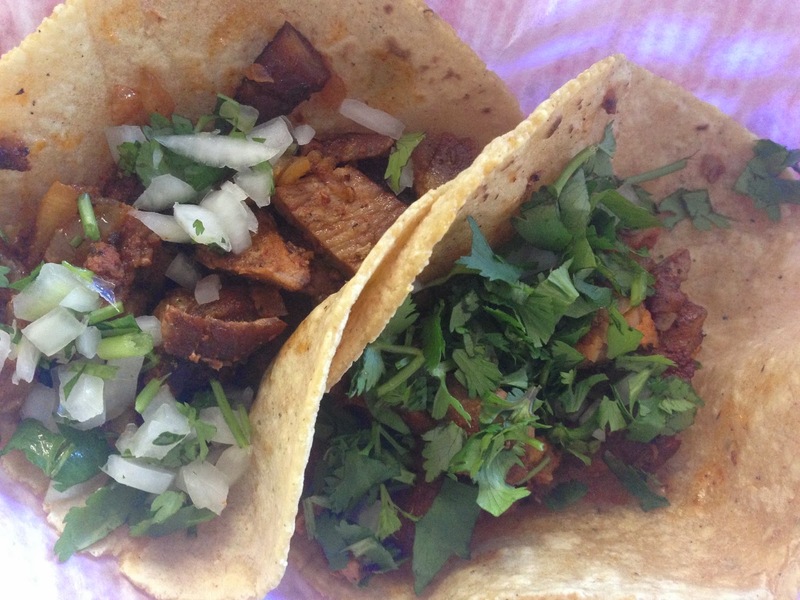 For the purposes of this post, I'm talking about traditional or street tacos. That means corn tortillas. Made from corn, water and lime (calcium oxide). More on that process here, if you're interested. And while this post is meant to be an introduction, there is SO MUCH MORE information out there. And a lot of that information can be reviewed at The Serious Eats Guide to Taco Styles. 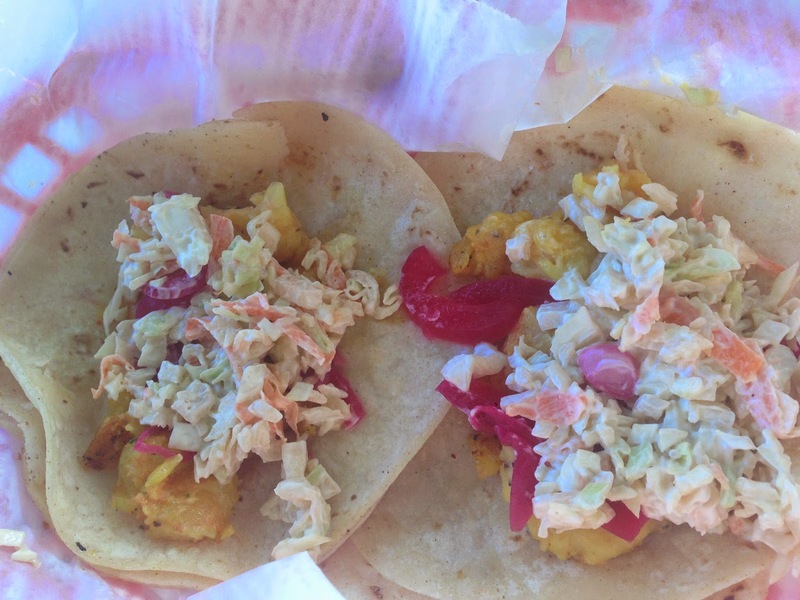 Information on the differences between griddled, fried, braised or simmered fillings, plus salsas, specialty tacos and much more information than you probably didn't know you even wanted to know about tacos. What you do need to know though, when visiting a new Taqueria (a Mexican restaurant specializing in tacos) though, are the food-related words. So the intent here is to help provide some guidance for places that might not offer English menus (or speak much English). 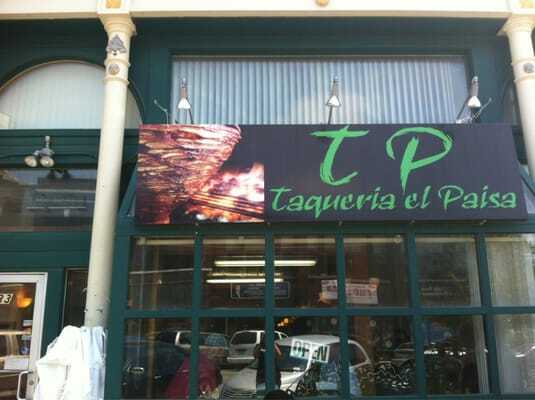 Taqueria el Paisa. Some of the best in town! 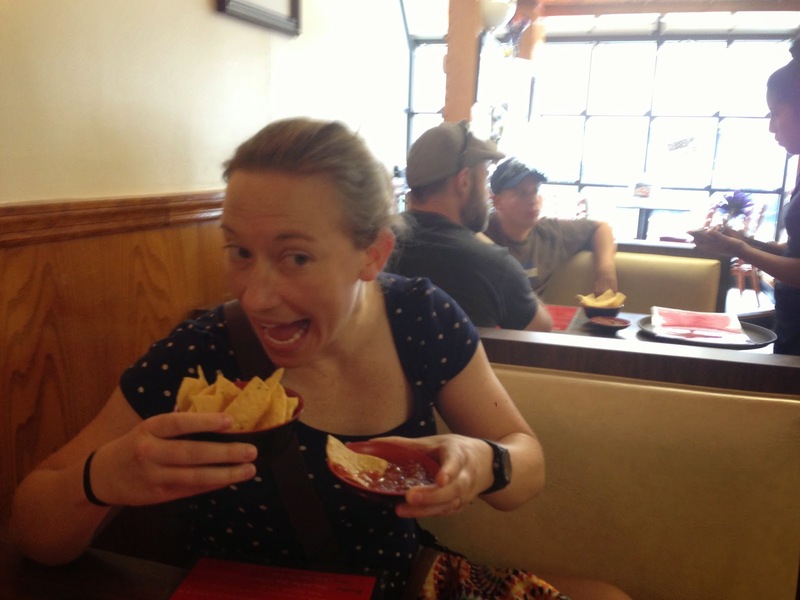 Sometimes there are chips too. Try to share. Fillings can really be anything. And let's just say that if you're really opposed to trying new things, this probably isn't going to be in your wheelhouse. But if you go in with an open mind, just know you're going to taste some pretty amazing things. Also worth noting, there are lots of animal parts in the fray here. So vegetarians, be aware of that. suadero or 'rose meat' (tender beef cuts). Tacos show up on two overlapped small tortillas, usually with onion and cilantro. Limes are typically made available to squeeze on some additional juicy goodness. Sometimes sliced radishes or pickled chile peppers make an appearance as well. Occasionally - but more rarely - you'll see some grilled onions or cucumber slices. Shrimp and fish tacos usually break the rule of 'cilantro and onion' and include some kind of slaw instead (see above). Tacos may also be served with salsa or guacamole, depending. Sometimes pico de gallo makes an appearance. Sour cream, cheese, lettuce, and the like are not included or needed. If you're counting calories, you can ditch one of the corn tortillas and save yourself 50 calories, but then you run the risk of compromising the structural integrity of your taco. Nobody wants that. The first Tour de Taco we did back in 2012 introduced me to Horchata. My taco tour immediately also became an 80 oz. horchata tour. And now I can't believe I lived on this earth for so long without it. So keep these words in mind also, and try out some new beverages to wash down all that taco goodness. Aguas Frescas (fresh waters) involve blending fruits, cereals, flowers, or seeds with sugar and water to make light non-alcoholic beverages. Many types are self-explanatory (watermelon, for example). Here are some others worth a try. 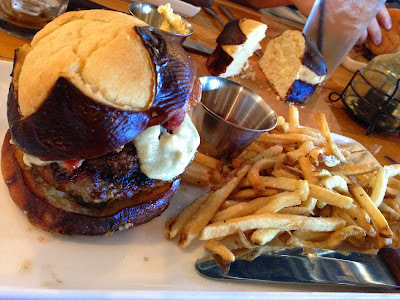 With summer upon us, people need to know... Where are the most delicious burgers in Omaha?? Honorary shout-outs to long-standing favorites Dinkers Bar (which people swear by, but I'm not a fan of), and Louie M's Burger Lust (which I haven't been to in 5 years and need to get back to soon), as well as potential contenders I've yet to visit The Salty Dog and Sinful Burger (where I've never been but have had bookmarked since it opened). For now, here's my list of burger recommendations! Turns out, I ended up with several different categories of burgers, so you can choose your favorite from my ordered list, or depending on the type of burger experience you're looking to have. Note that some of the best burgers in town - my mom's - did not make the cut since I don't think she's looking to have strangers show up in her backyard right now. Anyway, let the virtual feasting begin!!! 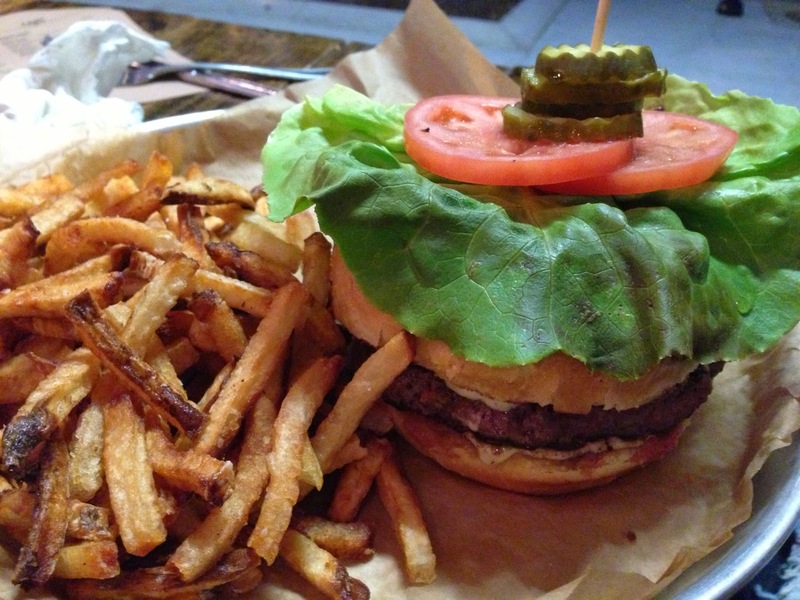 Category: mother of all burgers, the way a burger should be, the best burgers in town, etc. Actual Name: Whatever you get, it's gonna be good. There's a reason these guys are world famous. If you're really hungry, there's always The Stellanator. Toppings: Don't be afraid of the peanut butter. It makes everything better! Tips: I actually don't want to write too much about Stella's and hype it up to unrealistic levels. But I just want to say that this is my favorite burger, hands down. They do not disappoint. Keep an eye out on their Facebook page for Doughnut Day too (peanut butter, bacon burger on a glazed donut... mmm..). Note that they serve these beauties on napkins only. Not for the faint of heart or fearful of getting down to business. Category: hous-ground brisket, chuck and boneless short ribs. Toppings: house ground on a toasted bun. You can add bacon, sauteed mushrooms or onions, swiss, cheddar, american, gorgonzola or balsamic onion marmalade. Tips: Go for the latter two, plus bacon. (If you can bring yourself to not order the special, that is). Bill has been known to say this is his favorite burger in town. Actual Name: Just this month, specials included a Chorizo burger, Au Poivre burger, and an Ultimate mushroom swiss burger. Toppings: The "Local" "Motice" burger, pictured above from just today: House patty, The Grey Plume mortadella, Pin Oak Place egg, gruyere, Dijon, Cook Grow Sow greens and pickles on an onion bun. Tips: It's hard to pick just one favorite burger at Block 16. But it's always good advice to just get the special. If the special is a burger, that's a win-win. 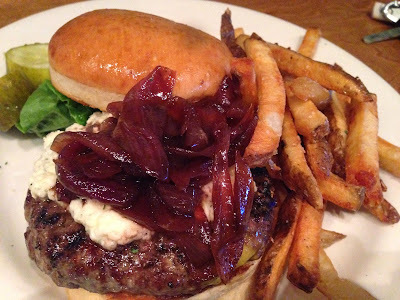 Toppings: local ground beef, house bbq, gorgonzola cheese, apple bacon, caramelized onion, garlic aioli, house pickle. Toppings: pretzel bun or challah, special sauce. Adds include caramelized onions, applewood bacon, avocado, fried egg, smoked gouda, white cheddar, maytag blue. Tips: I actually love the house dressing here (cashew vinagrette) so often opt for the side salad in lieu of fries. 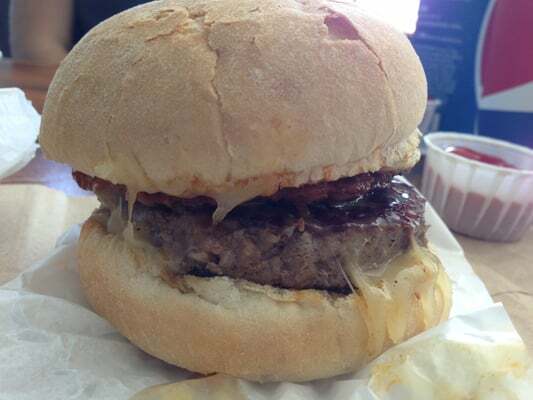 Toppings: made with certified piedmontese beef, lettuce, roasted tomato, bacon-onion marmalade, L2 sauce on a brioche bun. Tips: They serve this beauty up for brunch too, which might be just the thing you need. Toppings: hand-rolled choice ground beef with a fiery-hot blend of seasonings simmered in Big Mama's Spicy BBQ sauce and served on a fresh hoagie bun. Tips: "Looks like a brat, but it's not." Wash this spicy concoction down with a Cranberry Sun Tea. photo credit: NotoriousLBT on Flickr. They also have a 'Big Redd Burger' which is a milder version of the Afro. Toppings: angus beef, buttered brioche bun, parmesan-peppercorn aioli, guinness graised onions, boston lettuce, tomato, garlic dill pickles. You can add applewood smoked bacon or aged white cheddar too. 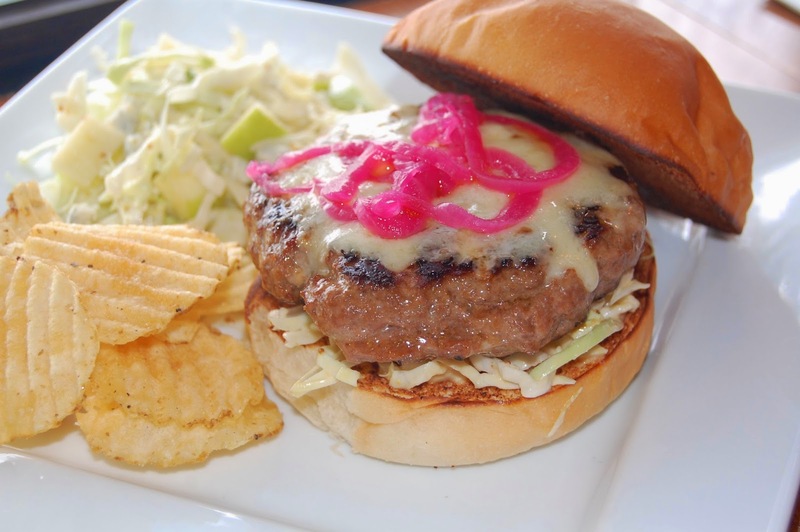 Toppings: 6 oz charbroiled burger with regular or pretzel bun. The Wild Ranch is my favorite and comes seasoned with cayenne pepper, served open face on grilled french bread with cheddar cheese and homemade ranch dressing. I can feel my arteries closing just writing that. Tips: Save some room for the bread pudding. Or take a whole pan home to bake later! 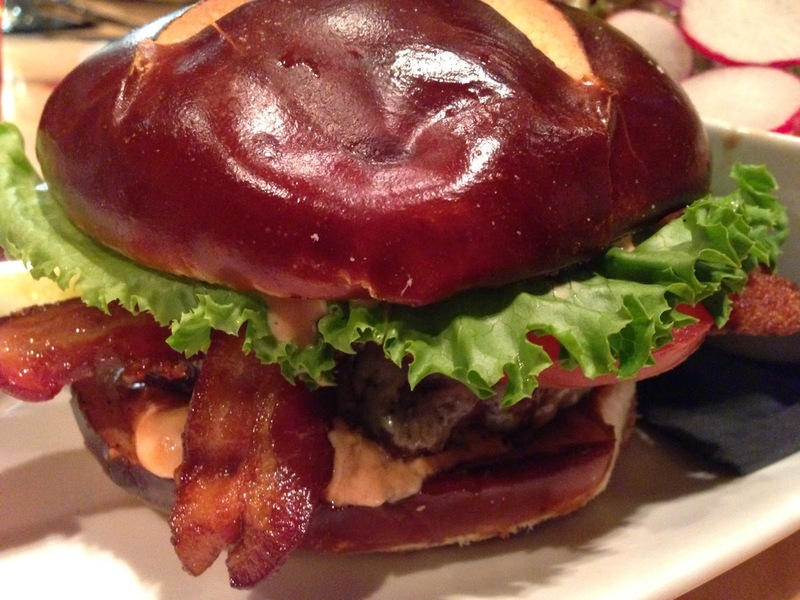 Toppings: Cabernet onions, white cheddar, apple wood smoked bacon, roasted garlic aioli, on a pretzel bun. Tips: Check them out for Happy Hour (which they adorably call 'Prime Time') when this thing is on special for $8. Can't say I'd recommend any of the other HH items though. Service is a winner! Toppings: Pretty sparce. It's fast food style after all. 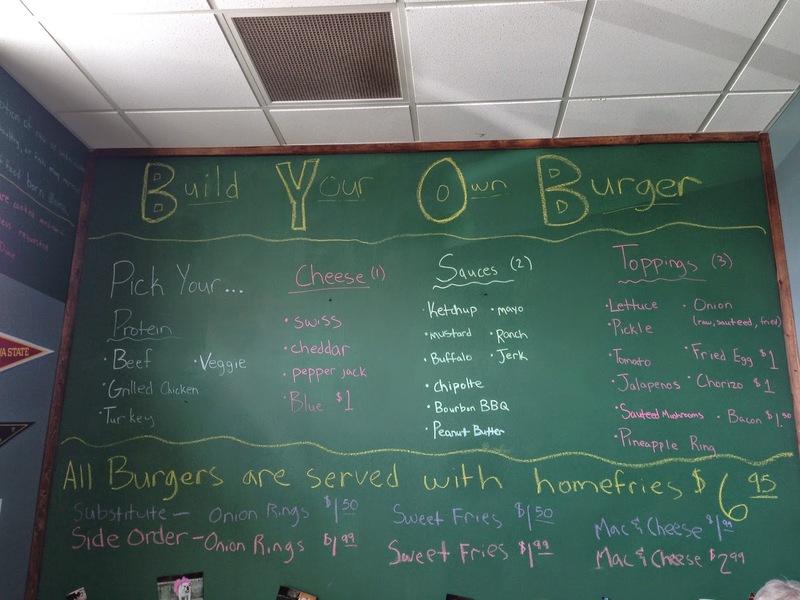 Tips: Omaha's first locally owned and operated fast food restaurant! 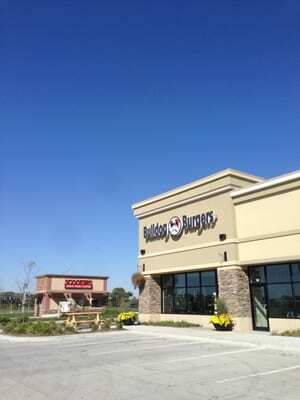 The 45th and Leavenworth location is actually the second location. Locally owned and operated. I also just learned they have breakfast! I've been asked to do a blog post about restaurants that allow customers to BYOB. And since I'm not aware of any restaurant anywhere that would allow you to bring in your own spirits, so we'll just exclude those from consideration. So where can you drag along your own WINE AND BEER in Omaha? (If "La Vie Boheme" just chimed up in your head... you're welcome). Turns out BYOB is great in theory, but not necessarily legal in implementation. There are many restaurants in town people suggested as potentials, but the initial [written] responses I got from many made me wonder if this were more of an underground scene. Sure, lots of other cities have restaurants that flaunt their BYOB availability. But it was surprisingly hard to find a list of potential Omaha restaurants that would allow it. That being said, I did find many (many) places that will allow you to bring in a bottle of wine, and apply a standard corkage fee. Still, people had some suggestions for places I should inquire of as part of my search. I combined these with some seemingly good contenders from Urbanspoon and Yelp for a 'candidates' list. I pinged many restaurants via Facebook, and got mixed answers (see below). Calling though, is always the best option if you're looking for information - short of actually going to the place and talking to someone face to face. The general rule of thumb though, is that if the restaurant doesn't already sell liquor (beer wine or liquor) in some format... they shouldn't be allowing customers to bring in their own... i.e. illegal. The real hitch though, is many restaurant owners probably don't know this. But don't worry, this kind of misunderstanding happens in L.A. and New York too. #6 - "If we let people bring their own we don’t need a license". The Nebraska Liquor Control Act provides that any place open to the public where alcohol is allowed to be consumed, is required to be licensed. 53-103(40) defines consume. A license is required if alcohol is allowed to be consumed even if those attending bring their own alcohol.And if that's not enough, I also emailed the LCC via their website. That question went to Mary, an Administrator at the Nebraska Liquor Control Commission Licensing Division. Mary forwarded to Sergeant Martin Costello, Nebraska State Patrol, Alcohol/Tobacco Enforcement Coordinator - Investigative Services. And Martin forwarded it to Sergeant Lonnie Connelly of the Nebraska State Patrol. Since the State Patrol serves as the primary enforcement agency for the Nebraska Liquor Control Commission as Enforcement Coordinator these matters are often forwarded to my attention for a response. If the restaurant does agree to allow you to bring your own alcohol they would need to have a liquor license since alcohol is being consumed and it is open to the public. The type of license needed could be a couple of different classes, but most restaurants hold a Class I license that allows on premise sale and consumption. I hope this answers your question. Feel free to contact me if you need any further information. You can search for liquor licenses currently on file with the Nebraska LCC. So supplied with my list of 'candidate restaurants', I set out to do some initial research. Unsurprisingly, all of the restaurants with liquor licenses allowed BYOB - generally wine only. Corkage fees apply in many instances. And they can definitely rub people the wrong way if you're not prepared for them... so better to ask ahead. The overwhelming 'official' response from restaurants without liquor licenses is that they DO NOT allow customers to bring in their own beer and wine. As far as the other 'candidate' restaurants are concerned, I've decided not to even divulge that list fully. Maybe they will allow a discrete customer to bring in their own beverage for private consumption... but it's not technically allowed. Maybe they don't know they're breaking the law. And maybe the LCC will turn a blind eye as long as no-one is calling in complaints. That's a lot of maybes though, and of course I wouldn't want to draw undue attention to any of my - or your - favorite restaurants that are maybe participating in this practice. After my research, I've discovered several places that previously or currently still will allow a customer to bring in wine or beer without corkage, that are pretty firmly camped in the without liquor license category. So in some ways this is probably a disappointing post for some. Though hopefully it helps impart wisdom on our BYOB practices. Any feedback would be appreciated! 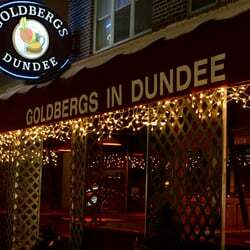 (Though I'd discourage calling out your favorite BYOB places without liquor licenses for the reasons stated above). Any other information people should know? Block 16 - BYOB wine with a $10.00 corkage fee. Dolce - Allowed with a $20 corkage fee, which is waived if you also purchase a bottle from their list. French Bulldog - BYOB wine and beer. Although, they charge a corkage fee of $20. Lot 2 - BYOB wine with a $15 corkage fee, though it has to be something that isn't on their list. M's Pub - BYOB wine with a $10.00 corkage fee. Mantra - BYOB wine with a $12 corkage fee. They also do $12 bottomless mimosas for brunch on Saturday (11am-2pm) and Sunday (9am-2pm)! Sunday and Monday evenings are 1/2 price wine nights also! Mark's Bistro - BYOB wine welcome with a $10 cork fee, waived if you buy another bottle on your visit. 1/2 price wine nights on Monday and Tuesday evenings. Nosh Wine Lounge - BYOB wine with a $15 corkage fee. Plank Seafood Provisions - BYOB wine with a corkage fee of $20. Interestingly enough, Plank also offers 4 tap wines! Salt 88 - BYOB is allowed. Wine only. Corkage fee of $20/bottle. Wine list includes 166 bottles "with a great emphasis on California and Italian Wines. We also feature unknown varietals to the Omaha market". Taita Restaurant - Exception to the trend, Taita will allow some spirits to be brought in. Plus wine and beer. Corkage fee of $15 applies. They accommodate lots of request from guests asking for specific bottles within reason. If you give them a heads up, they could put together whatever you're looking for. V. Mertz - BYOB wine with a corkage fee (I'm assuming $20). Though they do waive corkage if you also purchase a bottle from their list. They're also amenable to guests bringing in sherry, craft beer, port, etc - given the circumstances. So just ask away! Even if you don't want to drink the second bottle there, they're more than happy to send you home with one. 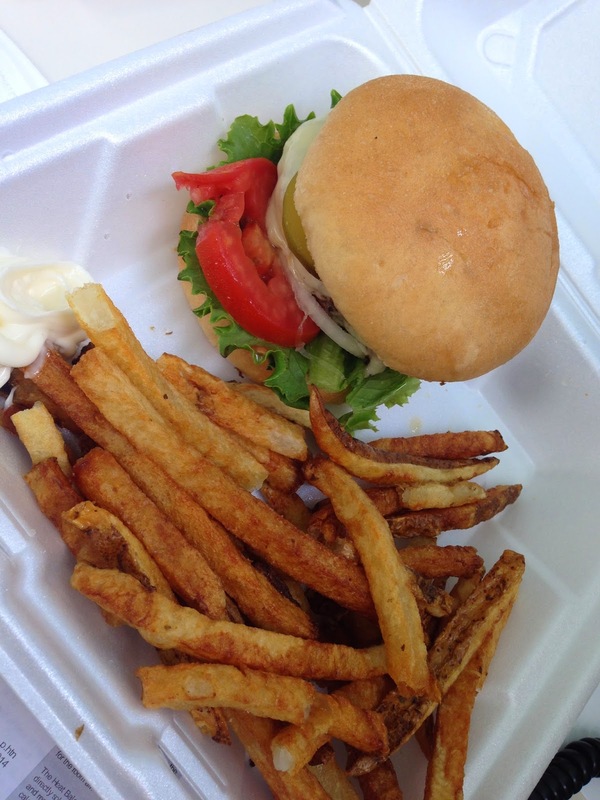 UPDATE: As of December 2014, Bulldog Burgers is permanently closed. Nobody seems to know exactly what happened, but I'm sure it all comes down to money - as so many things do. The space is now up for lease. Fingers crossed something else pops up soon. 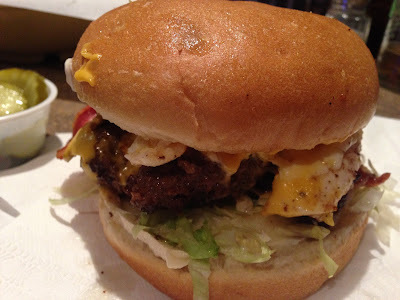 My first review of Bulldog Burger left me wondering if I'd be jogging or walking back... definitely not running, but I knew I'd be back eventually. Or 3 more times in 8 months. Whichever. And actually, writing this review is making me want to go back again... Hmm. That bodes well for the future of Bulldog Burger, at least in my eyes. Because damn if they aren't getting better with time. To showcase this phenomenon, the story is best told in pictures. From my first visit, in October of 2013 - shortly after they opened - to just this week. Storefront. Not a ton of options in the area (any). The Breakfast Burger Combo - with FF. Back in October. Menu board. Luckily they also offer printed. Check out the whiteboard for daily specials or make your own! 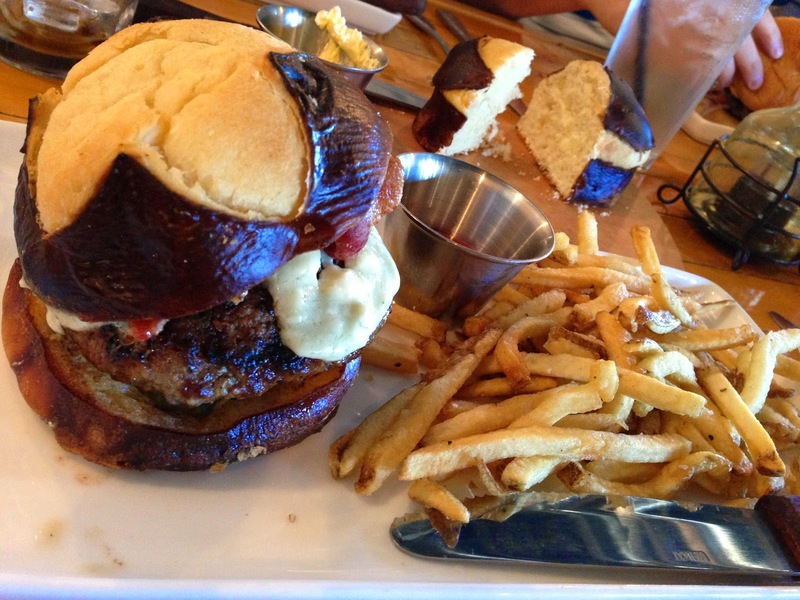 PB&J Burger... literally, that's it. Mac & Cheese bites. I've now eaten BB in several forms. Dine in, carry-out, catered lunch and drive-through. In my previous review, I complained that my burger wasn't messy enough. But that has apparently been ratified to my satisfaction - and moreover, in the course of posting these pictures my star rating has actually increased another star. The food is good, they have a great social media presence, full menu online, and you can tell Chuck (the owner) truly cares about what is going on here. He's constantly trying to improve (case in point just this week they're considering increasing the burger size from 1/3 lb to 1/2 lb and are asking their Facebook fans to weigh in). So yes, this absolutely is not a place I thought I'd be fawning over when I first set food here back in October. But they've made some pretty enormous steps in the right direction so far. 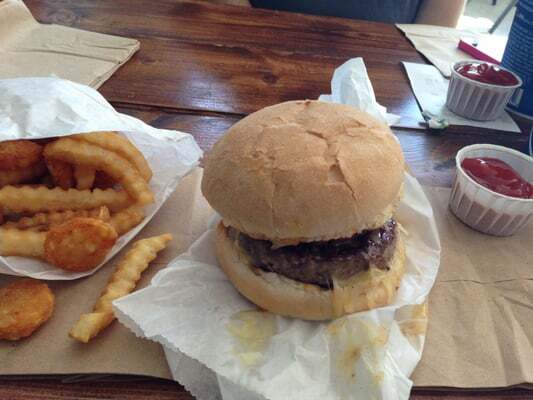 And for what Bulldog Burger is doing - they're doing it very, very well. What we're left with is a fast, casual eatery who has their finger on the pulse of what their customers want. And each time I've been back - the burgers have been better. No joke. For these reasons I'm happy to give Bulldog Burger a 5-star review. Check it out if you're in the area and be prepared for some wholesome meat love. They still have some ground to cover if Bulldog Burger is to live up to their motto ("The Best Burgers in Omaha") but it's good to have lofty goals! Now, they just need to get more promotional photos with the namesake bulldog, and we'll be set. 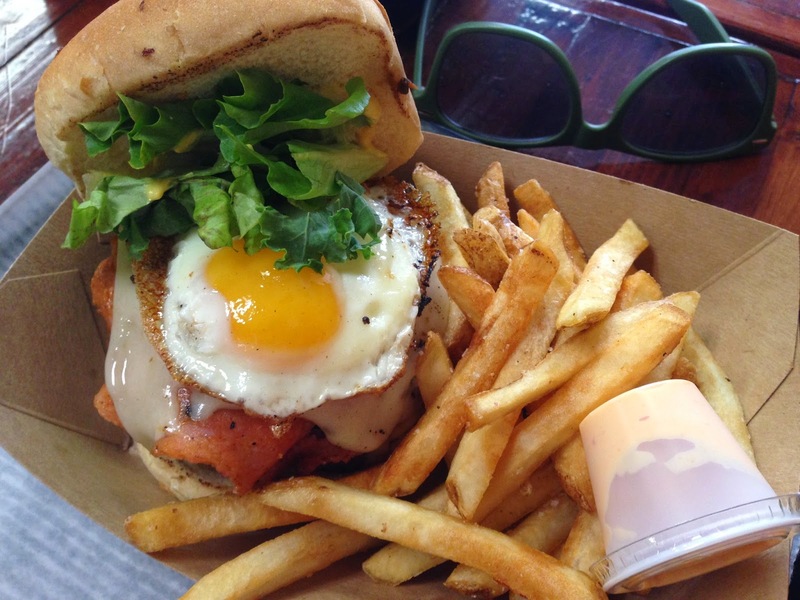 Breakfast Burger: "Topped with a Fried Egg, Chorizo Sausage patty, a Zesty Chipotle Ancho sauce & Cheese". 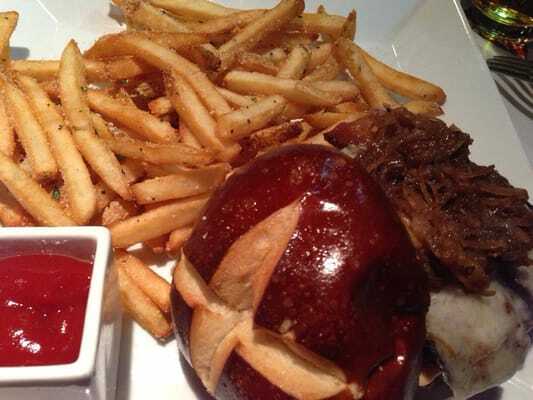 PB&J Burger: just what it sounds like. A bit underwhelming... could've done with more PB... or maybe it needed egg and bacon. The good thing is that you're free to customize your burger as you'd like here! 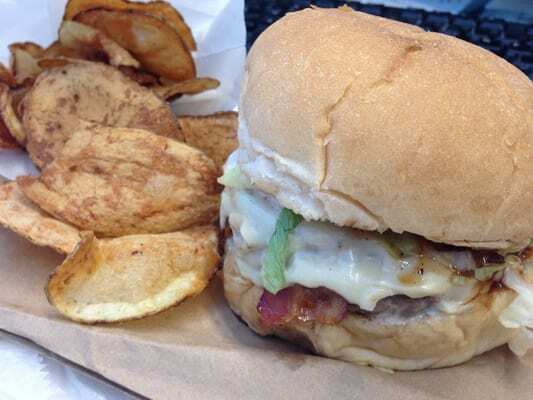 The Citrus Burger: "Topped w/ a Caramelized Pineapple ring, Jerk Sauce, Lettuce, Bacon & Cheese." Decent flavors, but again - I should have added more stuff to mine. Apparently my palette just wants crazy burgers at places that enable you to have them. 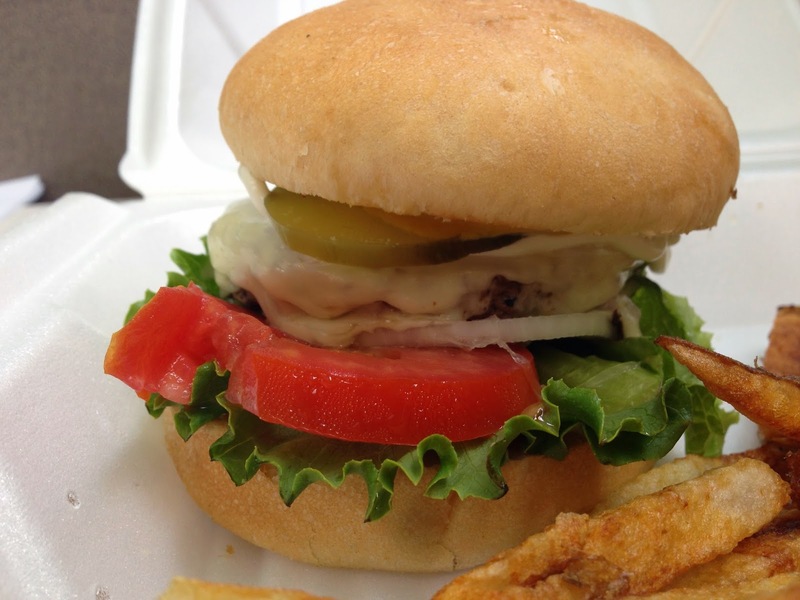 The Bulldog Burger: "All the fixings; Cheese, Tomato, Onion, Pickle, Lettuce, Ketchup & Mustard." The best one yet! Super fresh everything! Plain and fabulous! 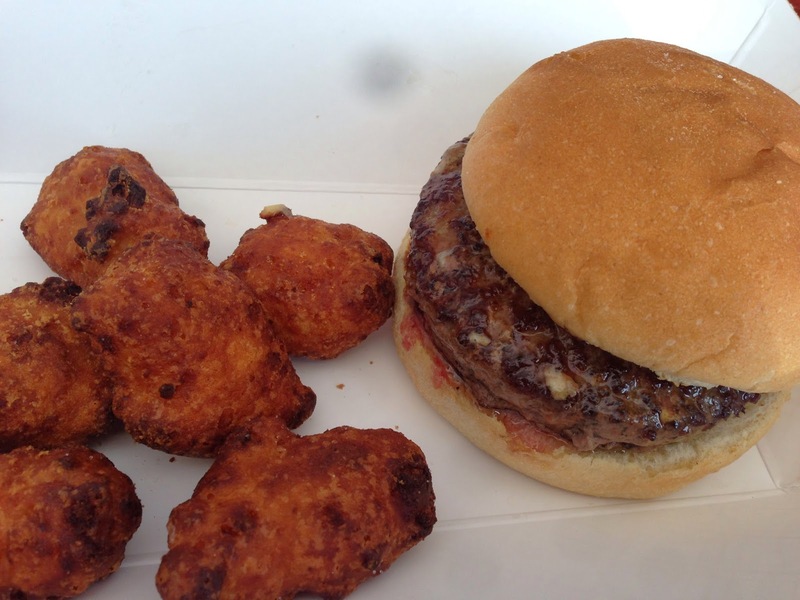 FF - the earliest iteration of a side item - fries and tots. I miss the tots. chips - though I think they got rid of these too. fries - which I hear are hand-cut daily. onion rings and sweet potato fries - decent. fried smoked gouda mac & cheese bites - which aren't made on site, but who cares they're great.